Karamani /black eyed peas is the main ingredient for this adai. But my MIL adds other grains like ragi , mochakottai ,chana , green gram , black gram , unpolished rice (nel) , wheat germs , toor dal to make it a mix of nine grains in very little quantity, roast and cook it. But many people use only karamani / thatta payaru for this adai. So its our choice finally! Below you can find a picture of adai with hole in the center. 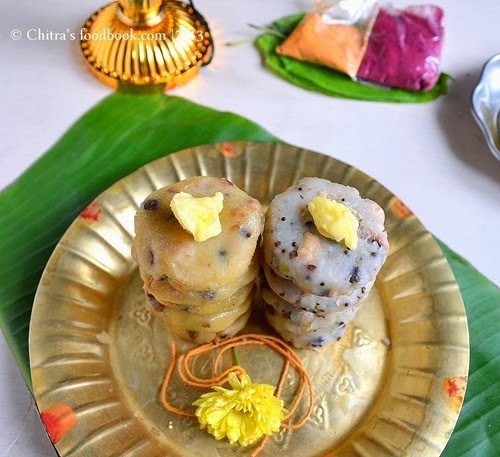 The color of sweet adai depends on the color of jaggery you use . 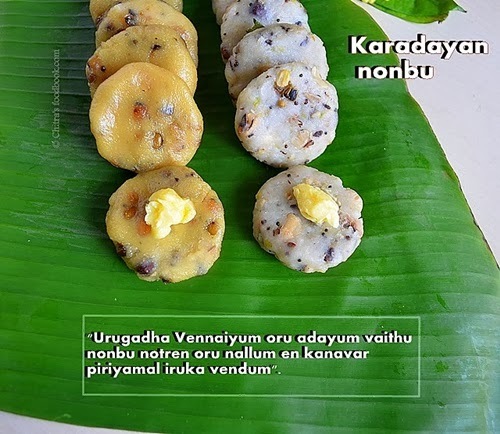 Ok lets see how to make karadaiyan nombu adai recipe with step by step pictures and video. Karadaiyan Nonbu or Savitri Vratham is a traditional Tamil nadu festival of fasting wherein married women pray for the wellness and long life of their husbands. 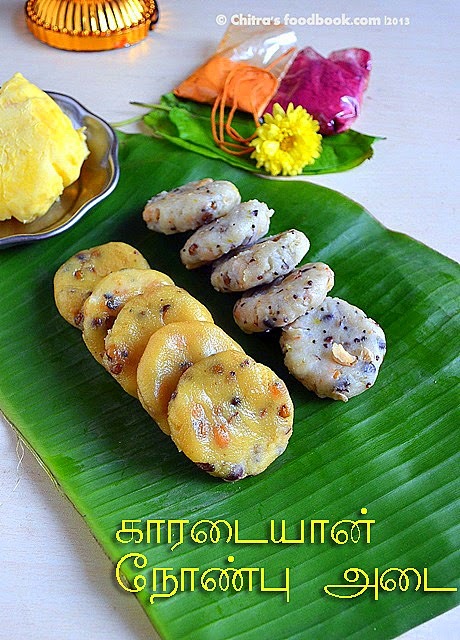 This nombu should be done exactly in the time when tamil month 'Masi' ends and the next month 'Panguni' starts. The reason why this fasting is carried out is that “ Savithri fought with yema (the God of Death) to save her husband's (Satyavan) life", the same way the married women should fast on this auspicious day for long life of their husbands. Unmarried woman can also observe Karadayan Nombu and pray to Goddess Shakti to get good men as their husband. Before marriage , I have not celebrated this festival as my mom don’t have this practice. I heard about this celebration from my MIL only after my marriage. Initially I used to watch my MIL making nombu adai. She makes Sweet adai/Vella adai and Salt adai/Uppu adai for neivedyam. But now I can confidently make it on my own. It comes out very well. What I love in this festival is tying the yellow rope. More than me, my daughter is more curious about tying the yellow rope in her hand ;) Also we chant a few lines/sloka in front of the lamp while tying the rope. “ "Urugadha Vennaiyum oru adaiyum vaithu nonbu notren oru naalum en kanavar enai piriyamal iruka vendum". Please click THIS LINK for Karadaiyan Nombu Pooja Procedure with more details! Wash & soak raw rice for 2 hours and drain all the water completely. Spread the rice in a news paper or white cloth to absorb all the excess water. Grind in mixie to make a fine powder. Sieve & dry roast the flour in low flame till you get light fumes from the flour. After roasting, try to draw a small kolam with it. If you able to draw it without cutting, flour is roasted well ( Kolam maavu padham). Sieve or grind once in a mixie if there are lumps after roasting. This is called processed rice flour. We use this flour for making adai. Usually I make the flour in the previous day and make adai the next day . For 1 cup of raw rice , we get approx 1.75 - 2 cups of flour. You can also use store bought idiyappam flour instead of homemade processed rice flour. ** For store bought rice flour/idiyapam flour, you don't have to roast the flour. 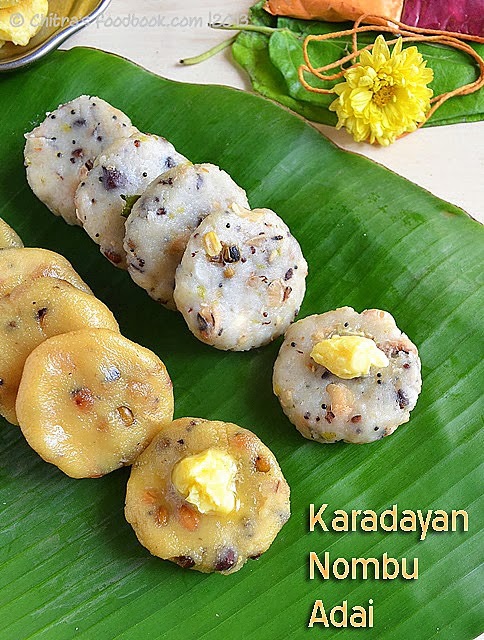 Karadaiyan nombu special adai recipe using rice flour, karamani as major ingredients. Both sweet adai and salt adai recipes are discussed below. ** For store bought rice flour/idiyappam flour, you don't have to roast the flour. ** Its completely optional to use navadhaniyam. **Use a mix of white or brown chana, ragi, green gram, urad dal, toor dal (Navadhaniyam )along with black eyed peas (karamani). But it is completely optional. You can use only karamani which gives nice flavor to this adai. Quantity of karamani can also be adjusted as per your taste. ** For store bought rice flour/idiyapam flour, you don't have to roast the flour. For homemade processed rice flour, please check it above. In a pressure cooker base, roast karamani in 1 tbsp oil till it emits nice aroma. Add water and pressure cook in low flame for one whistle. Divide the karamani into 2 portions. FOR SWEET ADAI / VELLA ADAI : Melt jaggery in water and strain the syrup. Add cooked karamani, coconut bits and cardamom powder in jaggery water. Let it roll boil. Lower the flame and add the rice flour (Homemade or store bought idiyappam flour). Mix well in low flame to make a soft dough. Switch off the flame. Let it become warm. Grease hands and make shapes. 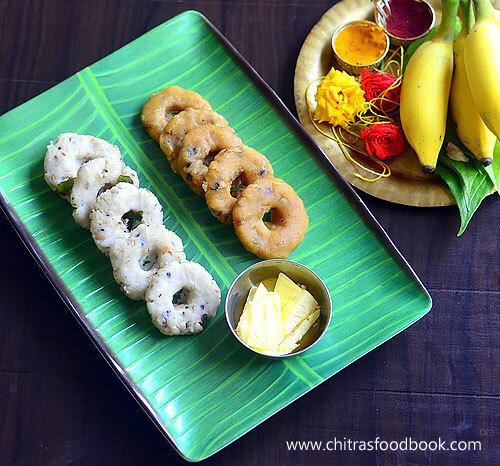 Make a small hole in the middle and arrange the sweet adai in a plate. Make salt adai next. FOR SALT ADAI / UPPU ADAI : Heat coconut oil in a kadai and splutter mustard, urad dal, curry leaves, hing, green chilli and ginger. Add water, salt, coconut bits and cooked karamani. Let the water come to roll boil. Lower the flame completely. Add rice flour and mix well to make a soft dough. Grease hands and make shapes after it becomes warm. Keep in a plate. Boil water in a idli pot and arrange the sweet adai and salt adai in greased idli plate. Steam it for 15 to 20 minutes till adai becomes non-sticky to touch. Switch off the flame. Let it rest for 5 minutes before removing the adai. Take the adai carefully and arrange in a plate. PLEASE WATCH THE VIDEO FOR BETTER UNDERSTANDING. Roast Karamani and other grains in 1 tbsp oil till nice aroma emanates. You can roast in a pressure cooker base. Roast in medium flame for 6-8 minutes. Pressure cook the grains adding 1.5 cups of water. Drain the water and keep the grains aside. HOW TO MAKE SWEET ADAI / VELLA ADAI : Take water & grated jaggery in a wide bowl. Heat it and melt the jaggery completely. Strain the jaggery syrup using a metal strainer to remove the impurities if any. Wash the bowl and again transfer the syrup to same bowl. Allow the syrup to boil for 3 minutes till the jaggery smell leaves. Now add the cooked karamani, coconut bits, cardamom powder, ghee and boil for sometime. Keep the flame completely low & add the rice flour in one hand while mixing with a ladle in other hand. Make sure to mix well without lumps. The mixture will thicken and will become a dough. After the dough is warm , grease your palm with oil and take a small ball lime sized ball of dough. Flatten it like masala vadai. Make a hole in the center if you like. We don't put a hole generally. Arrange the adai in a greased idli plate. HOW TO MAKE SALT ADAI / UPPU ADAI : Heat oil in a kadai and temper mustard, urad dal, cumin seeds, green chilli, ginger, curry leaves and hing. Add water, required salt, coconut pieces, cooked karamani. Mix well and allow to boil for sometime. Then add the rice flour and mix well in low flame to make a dough. After the dough cools down , make small balls. Pat it like vada and arrange them in a greased idli plate. Arrange the sweet adai and salt adai in a greased idli plate. Roll boil water in an idli pot and place the idli plate with adai. Steam it for 10-15 minutes. Switch off the flame and let it rest for 5 minutes. Remove it carefully to avoid breaking. Please click THIS LINK for Karadaiyan Nombu Pooja Procedure ! Instead of roasting karamani, you can soak it overnight or 4 hours and then pressure cook it. You can also use good quality idiyappam flour instead of homemade processed rice flour. For variations, you can grind green chilli, ginger to a paste and add to water in salt adai. Try this easy, yummy Karadaiyan nombu sweet adai and salt adai. Offer with unmelted butter to GOD. Enjoy the festival ! Beautiful write up Chitra, neat pictorials n pics...good one! Beautiful adais, excellent and neat presentation..
Nice explanation about the pooja and loved the mantram you tell while tying the rope.Love the savory version a lot. Tasty adais! Wonderful snaps, Chitra! Very nice adais and a happy celebration. Nice post dear. I missed making these adais for nombu as I was away from home.Very happy to see the festive pooja plate with the sharadu and the delicious adais topped with butter. Karadaiyan nombu pooja procedure,date and time 2017! Thanks for bringing back happy joyful memories.I love the sweet and savoury adais. Beautiful and yummy. Karadaiyan Pooja-fasting and prayers will be held on Monday the 13th March 2017(morning) in Toronto.Share adais with friends and family.Have fun.